Here is the second version of the popular MoPower UPS. We have taken the core of what made our original UPS popular and expanded it's capabilities and specifications. More then just a full featured UPS for the Raspberry Pi, the MoPower features a highly flexible design featuring highly configurable power control logic, which make it suitable for many projects. It has been used successfully in many scientific, industrial, automotive, and solar projects around the world. Up to 6 hours of backup time using common NIMH AA batteries (6 cells), greater backup time is available by using larger batteries or more cells. "Wake On Event" feature allows startup or shutdown of your Pi based on any various inputs, such as input voltage levels or digital inputs. This is perfect for automotive computers and can be set to power on and off your Raspberry Pi based on engine running state with only one power input! Also useful in solar applications. An automotive grade TVS (transcient voltage suppressor) protects your Pi from when used in a harse automotive power environment. Full two way communications between UPS and Pi, including reporting of Vin and Vbatt levels. Optional INA219 current sensor wired to the 5v power for the Pi. 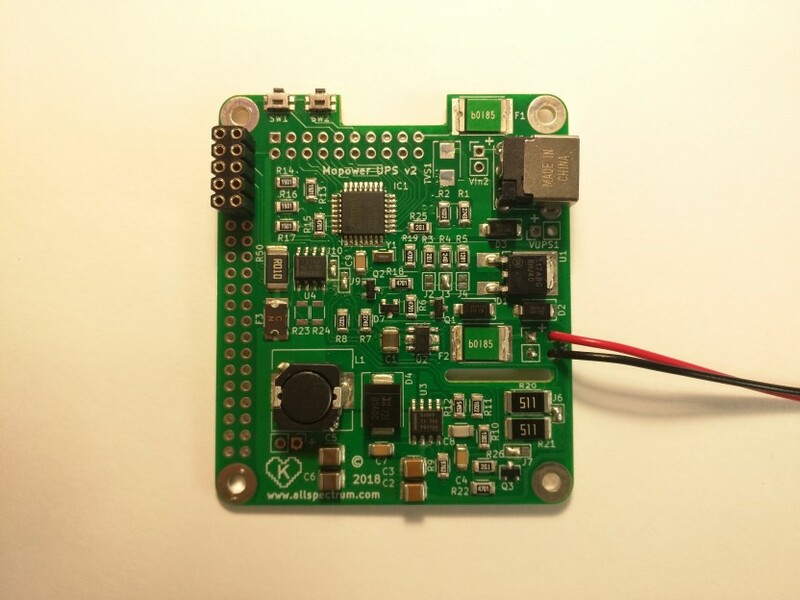 Monitor real time voltage, current and power consumed by your Pi! Watchdog timer! Auto reboots the Pi if it crashes! Onboard buttons for easy shutdown/reboot, optional top mount button available and external buttons can be added easily. Onboard RTC with timer based (Wake On Timer) power on/off capability, great for remote battery powered applications to conserve power. NOTICE: This product is intended for use by experienced users. Batteries are dense sources of energy and must be handled properly. Users should be familiar with proper battery handling/use, general electronics design and safety. Improper use can pose hazards. Detailed information is available here. Optional INA219 current sensor addon is available HERE. Note the INA219 option must be ordered at the same time as the UPS as it adds optional components to the PC board itself. Note: This product has not been tested against and may or may not meet various regulatory, emissions and safety regulations in your country. This item serves as a battery/power supply section of a computer and is not a complete product. 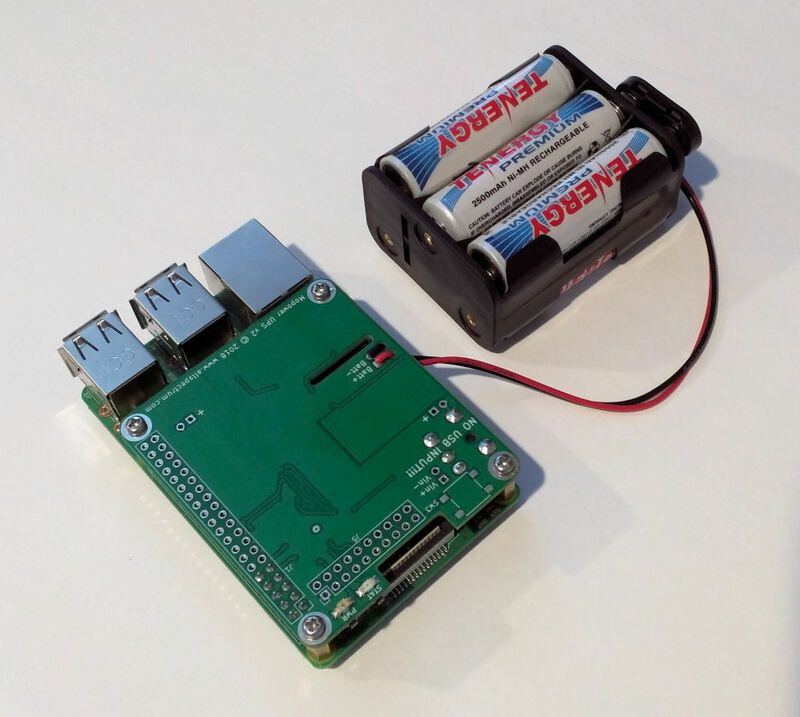 Users should be familiar with the technical details of operating a Raspberry Pi and proper handing/use of batteries and general electronics safety. This item should be used by those experienced in the components and general design of the product. Safe use of this item is ultimately the users responsibility. Improper use can pose safety and fire hazards.